Charmante, von grünen Hügeln umgebene Appartementanlage unweit des Traumstrandes, mit liebevoller Herzlichkeit in Son Bou, für unbeschwerte Ferien mit der ganzen Familie. Die sympathische Anlage befindet sich im Süden Menorcas, in Son Bou, nur ca. 1 km vom flach abfallenden Sandstrand entfernt und fügt sich idyllisch in die grüne mediterrane Flora der Umgebung ein. In unmittelbarer Umgebung laden zahlreiche Bars, Restaurants und kleine Geschäfte zu einem Besuch ein. Das Ortszentrum erreichen Sie nach knapp 1 km. Der Flughafen ist etwa 20 km vom Hotel entfernt. Der familienfreundliche Komplex verfügt über einen Empfangsbereich mit Réception, Lounge, Internetecke (gegen Gebühr) und WLAN (gratis). A-la-carte-Restaurant (mediterrane Küche), Bar und Café. Zur weiteren Einrichtung gehören eine Boutique, Souvenirshop und ein Minimarkt. In der Aussenanlage befindet sich ein schöner gepflegter Garten mit weitläufigen Rasenflächen, ein Süsswasserpool mit Wasserrutsche, der Badespass für Gross und Klein verspricht, sowie eine Pool-/Snackbar. Die Nutzung von Liegestühlen und Sonnenschirmen am Pool ist gratis. Die hellen und farbenfrohen Appartements verfügen über Bad oder Dusche, WC, Föhn; Telefon, Sat.-TV, WLAN (gratis), Mietsafe, separater Wohn-/Schlafraum, Essecke, Kitchenette mit Kühlschrank, Herd, Mikrowelle, Tee-/Kaffeekocher, Klimaanlage; Balkon oder Terrasse. Fahrradverleih, Billard, Tischtennis, 2 Tennishartplätze. Wellness: Spa mit Solarium. Golf: Der 18-Loch-Golfplatz «Golf Son Parc Menorca» liegt in ca. 20 km Entfernung. Vermittlung durch Fremdanbieter: Reiten, diverse Wassersportarten am Strand (Windsurfen, Tauchen, Kanu, Wasserski, Tretboot). Booked a 2 bedroom apartment for mid-late October via Tui. Apartment itself was fine, bedrooms were not huge. There is a free to use safe, Wi-Fi was good, there's a clothes airer and a few pegs (small washing in bathroom although spin cycle on ours seemed a bit temperamental), sofa was fine for sitting on (have seen reviews saying uncomfortable but maybe that was for sleeping on? ), good aircon and shutters on all windows but no screens (I wonder if proximity to marshland might mean there are insects in summer?). Ours was upstairs and some upstairs apartments might end up with no shade on the front balcony as there are no awnings or umbrellas, but we had a well placed palm tree that did the job. Kitchen had a microwave, oven and 2 ring hob. There was a tea pot and one of those stove top espresso makers, however no chopping board, one small very blunt knife and no wine glasses, only tumblers, and no oven cloths/mitts. There's a good size fridge/freezer with ice cube trays. There were no cleaning materials left in our apartment (beside dust pan and brush) - although I saw one review saying there would be. I always think if an apartment wants you to wash up they should leave the means for you to do so. Grounds were beautifully maintained. What was not clear to me from booking via Tui was that the apartments have no pools connected to them, and any pools including the one at the San Jaime complex (closed for the season the day after we arrived, and apparently the water slide - one of the reasons I booked, had not opened at all this year according to the rep) or Son Bou Gardens or La Gondola you are expected to pay to use a sun lounger. The advertised price was 3 Euros but we were never asked for that, instead they seemed happy if we just bought a drink from their café. Sun loungers and an umbrella on the beach (fab beach short walk away - sea view from our upstairs apartment) cost 15 Euros for the day, reducing from 1pm with a further reduction if you arrived after 2.30pm. Highly recommend the little bakery in the small group of shops near the apartments. Staff in Menorca Vacations who handled our check-in (and where we were collected from for return transfer to the airport) were very helpful and friendly. Because it was end of season and our flight was not until 10pm we were allowed to keep the apartment for all of our final day which was brilliant. Highly recommend the walk on the Cami de Cavalls (not sure if that is how its spelt) to Santa Tomas, the next beach along. We took the inland route there and the beach route back but found the inland one more interesting. Be warned the restaurants, supermarkets and bakery all shut down for the season by end of October, and because this year had been quiet a number of them were already closed when we arrived on 19th October, with others closing daily. Had we been there a week later I think we would have needed to hire a car to drive to restaurants and the big supermarkets in the nearby towns/cities, although you can get the bus - presumably that continues to run. There was no sign of the little tourist train mentioned so presume that is only in peak season. Finally it is just like in the photos - they are very accurate. Enjoyed a very relaxing stay at son bou playa gold apartments. The resort is quiet and good for families. Had everything we needed in the apartment apart from a hairdryer which you can get at reception with a deposit. Ours overlooked the road while others are set back further from the road. Had view over to the sea and front and back terraces which was nice (although the back is more for drying clothes). They provide some cleaning materials and gel and body lotion on arrival. The towels are changed once a week as stated and no real cleaning is done during the stay but the flat is easy to keep clean and there are brooms etc in the cupboard. There is also a washing machine so can always wash things as required. The rooms are as in the photos- airy and cosy. The sofa is not so comfortable but all in all nice airy flat which felt like our home for the week. There is the cub san Jaime about 5 mins away in the complex where can get drinks meals and snacks and use the beautiful big pool. can lay on the grass there but watch our for the biting insects! or get sunbed 3 euro. in the square by san Jaime there is a supermarket, cash machine , good tourist shop and bakery and doctor. the little train also stops here and the bus stop is here so everything is close by. The walk to the beach is about 20 mins and commercial area 10-15mins - you could get the little train down if you wanted to or bus to stop by the commercial area if you are weary. The beach is fabulous and 3 beach cafes for dinner snacks and drinks. The apartments look pretty from the beach and don't spoil the coastline. can get the little train for tour around the complex and view from the top where the villas are. The gardens are all kept beautifully. There are playground areas for children and entertainment if you want it at club san Jaime along with games. The buses go to Mahon and Ciutedalla and Alaior from the bus stop 5 minutes away which is handy. There are restaurants shops and cafes in the commercial zone. Really enjoyed our stay here - wanted a relaxing holiday which is what this was- enjoyed the beautiful beach, the trips to the interesting towns and just taking it easy. The apartment complex is pretty with all the white villas and apartments and is basic but has everything you need and is near enough to the beach and all amenities. This was our first visit to Menorca and was very impressed with this beautiful and nature orietnated island. We stayed for two weeks at Son Bou Playa Gold from the 16th - 30th August. Although we booked our room via Alpharooms, I contacted Menorca Vacations directly who we were actually renting the apartment from. I had asked if we could be allocated an upstairs apartment due to having two children aged 9 and 3 years and wanted it to be more secure, however we were informed this could not be promised. We arrived approximately 9:30pm and a member of staff was waiting in their office reception that is situated away from the complex in the resort area. The lady was accommodating and stated we could formally check in the following morning due to the time. On arrival we were allocated a ground floor apartment (which our taxi actually took us directly outside of) - number 61 in Zone 3. I was a little apprehensive regarding this as reviews I had read before travelling stated that Playa Gold apartments are located in the areas of zone 4 and zone 5. We were assured however on arrival that this apartment was a Playa Gold and that they are situated in all of the zones and in amongst Son Bou Gardens apartments. We were situated at the front with an end apartment looking out onto the road with a restaurant behind us. I was a little worried that this may be quite noisy for our children. The apartment itself was quite basic, however there was everything you needed. After my initial disappointment and exploring the area the following morning, it became evident that all of the zones are a mixture of Son Bou Playa Gold and Son Bou Gardens apartments. We were actually in a perfect position as we were only a 5 minute walk to the small resort centre of Son Bou and no more than a 10 minute walk away from the beautiful beach. 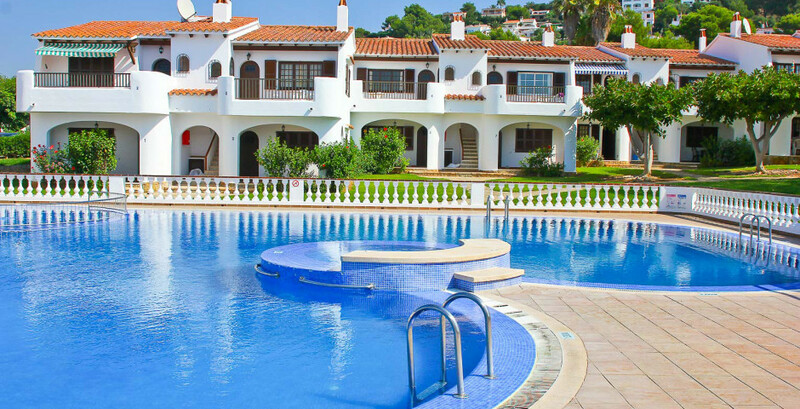 The actual complex is very well maintained, the pool areas were kept clean and the gardens were well kept and pretty. We also did not experience any noise from the main road outside. There was a swimming pool located right behind our apartment that we used on a regular basis. Please note that the swimming pools in the zones are not owned by Menorca Vacations but by local people who run this as their business along with their own restaurant - if you travel with Thomsons this is not made clear as there is a charge for sunbeds. Phillippe owed this swimming pool and restaurant and he was friendly and pleasant - always making a fuss of our children. He kept the sunbeds chained up and once you paid the charge of 3 euros each and 2 euros for an umbrella he unlocked them for you. Phillippe and his staff were lovely and we ate in his restaurant a number of evenings as he also had a bouncy castle for the children. Although the back of our apartment was close by we did not encounter much night time noise - although there was the usual sound of furniture being moved in the upstairs apartment during the early hours! The staff we dealt with at Menorca Vacations were all extremely helpful. They provided us with resort information, arranged taxi's for us and although we were unable to keep our room longer on the day we were leaving, we were able to make use of their shower room and luggage room, which they supplied with towels and toiletries. There is also a public swimming pool located between zone 4 and zone 3 which was called Club San Jaime. This was a large swimming pool that charged 3 euros per sunbed. They also had two waterslides that you could pay to use - 10 rides cost 6 euros. There was also a restaurant there that served lovely food. The resort of Son Bou was perfect for families. Although it is a small resort, there were plenty of restaurants to choose from, lovely little shops, a few supermarkets and a lovely small bakery just a minute away from our apartment. There is also a land train that takes you around the whole of the resort. The beach was also very clean and the sea was crystal clear. It cost 18 euros to rent two sunbeds and an umbrella and watersports were available such as a pedalo, boats, the banana ride and water inflatables. There was also a choice of three restaurants to choose form on the beach. Overall we had a lovely family holiday to Son Bou Playa Gold, for us our apartment was situated in an ideal location, in a lovely resort with all amenities for us as a family. We would most certainly return to Son Bou Playa Gold apartments in the future. I was a little disappointed to begin with as we had booked holiday over a year ago and requested an upstairs apartment with balcony we got a ground floor terrace. This meant as we were on the main road there was very little privacy when sitting out. Apartment was immaculate tho if a little dated and sofa was so uncomfortable. Rooms were spacious and very well equipped. Everything you needed for a self catering holiday was there. Beds were very comfy. We used the pool which was nearest to our apartment it wasn’t too busy and we were happy to pay the 3 euros for a sunned for all day. The staff at la gondola were very friendly and made you feel at home. Prices in supermarket were not too bad. We also ate at club san Jamie which was good. Again staff were very friendly. Entertainment was typical holiday entertainment. Kids had a fantastic time. It was their first trip abroad. A kids club would have been good. All in all a very relaxed and enjoyable holiday for us all. It is a very safe child friendly place. We would highly recommend it and are already planning our next holiday there.